The Bellingham/Whatcom/Skagit area is lucky to have some wonderful berry producers. We get some of the freshest, ripest, most delicious berries in the world. Since I grew up around here, I’m spoiled when it comes to berries. Sometimes I buy berries imported from elsewhere (during the winter), and they never measure up to my expectations. So during berry season, I like to eat enough to hold me over til next year. I think raspberries are my favorite berry. They are delicate, sweet, and just melt in your mouth. So, where can you get some of the freshest raspberries around? In Lynden! I know a lot of Bellingham residents don’t make it up to Lynden very much, but it’s a cute town that knows its produce. 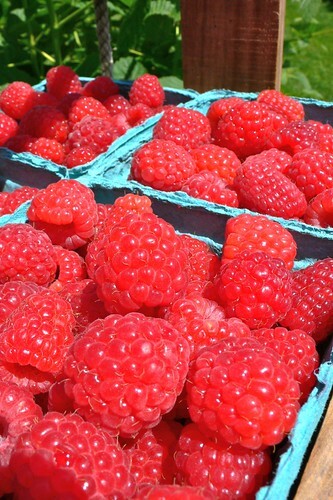 The Lynden area produces the largest harvest of raspberries in North America! And it’s hosting the annual Lynden Raspberry Festival today and tomorrow (July 16th and 17th, 2010). There will be jazz music, a street fair, and of course all things raspberry! It’s all going on in Lynden on Front Street, between 4th St. & 7th St. It’s just an easy half hour drive north of Bellingham! There’s a pancake breakfast on Saturday, a classic car show, and even a basketball tournament. I think it would be a nice way to get out into the country for an afternoon. Plus, you can fill up on local raspberries! For more information about Lynden, check out the Lynden Chamber of Commerce‘s website. Happy eating! Photo is from Flickr user hfb.